I am still playing this market cautiously. I will consider adding another long position to the portfolio, but won’t do it on anything less than ideal trading conditions. Right now the headline risk is notable, and prevents any significant long exposure in this market. VIX – Saw a 1.1% decline despite the market engaging in a sell-off of its own. Nearing a break below of 20, as it currently sits at 20.24. T2108 (% of stocks trading below their 40-day moving average): Another bullish outcome in T2108 yesterday. Rose about 1% despite a market sell-off. These bullish divergences continue to pop up on this indicator. Moving averages (SPX): The 20-day moving average continues to resist any breakout to the upside. Today will be another test of the stubborn MA. Energy remains the strongest sector in the market as its breakout is well underway now. I regret to a certain extent not trading this particular sector, but I made a decision to avoid the less dependable sectors and focus on the best sectors of the past year when trading the bounces in this market. Real Estate remains strong, as well as Utilities, as they both continue to establish higher-highs and higher-lows off the February lows. Financials continues to struggle with the bounce off the lows. 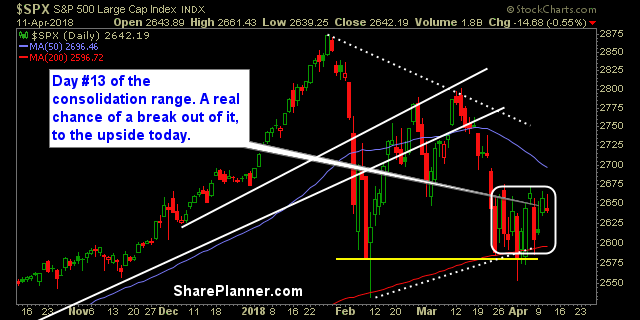 Price action on SPX still remains stuck in a strong price consolidation pattern. Today’s pre-market strength may lead us into an upside break and drive the market notably higher and squeezing the shorts along the way.